After leading for most of the event, Raana Horan and Klem Christiansen had the Haeusler’s Mallee Rally ARB 400 victory within grasp when three corners from the finish line, Danny Brown and George Apted dove the #42 Jimco hard into the corner, sneaking passed Horan to greet the checkered flag and claim his first Haeusler’s Mallee Rally ARB 400 title. 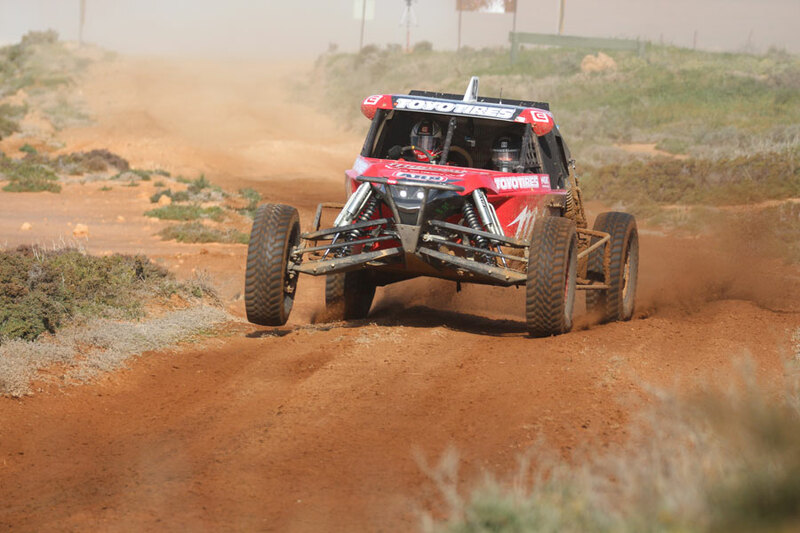 After rolling in prologue, Aaron Haby has come back fighting, slotting the Element Prodigy into third place rounding out the Haeusler’s Mallee Rally ARB 400 podium. Liz Haby navigated for the first two laps, however, illness prevented her from continuing; Andy Ryan, now in the pits after engine failure in the #50 Alumi Craft ended his weekend, jumped into the navigators seat to guide Aaron to the finish line.